Lee Woolery|Miami Valley Today Troy’s Jackson Goodall chases down the ball during a match at second singles Thursday against Fairborn. Lee Woolery|Miami Valley Today Troy’s Nathan Kleptz follows through on a backhand during a match at first singles Thursday against Fairborn. Lee Woolery|Miami Valley Today Troy’s Genki Masunaga serves at third singles Thursday against Fairborn. Lee Woolery|Miami Valley Today Troy’s Noah George winds up for a forehand at first doubles Thursday against Fairborn. Lee Woolery|Miami Valley Today Troy’s Sean Dippold hits a forehand at first doubles Thursday against Fairborn. Lee Woolery|Miami Valley Today Troy’s Henry Johnston follows through on a forehand at second doubles Thursday against Fairborn. Lee Woolery|Miami Valley Today Troy’s Spencer Short hits a forehand at second doubles Thursday against Fairborn. 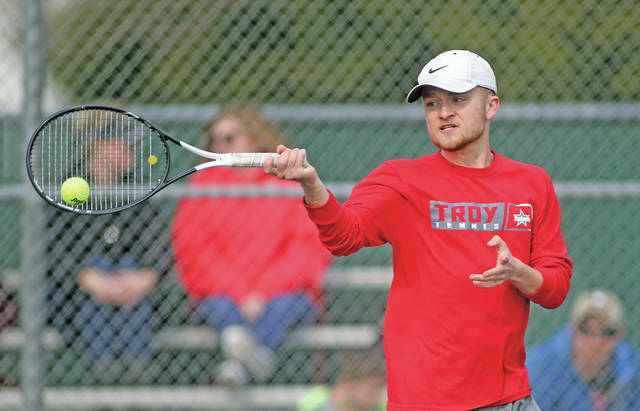 TROY — Troy tennis coach Mark Goldner isn’t used to having undecided position battles still hanging after the start of the season. “Tomorrow, it ends,” Goldner said with a laugh. Nathan Kleptz and Jackson Goodall — former doubles teammates and the only two returning varsity players off of last year’s team — are still battling it out for the first and second singles spots three matches into the season, but after the Trojans topped Chaminade Julienne 4-1 on Wednesday and Fairborn 5-0 on Thursday, the duo will finally settle things in a third trial match between the two Friday morning. Kleptz and Goodall have split two trial matches so far, both of which have gone to a third-set tiebreaker. Twice they were scheduled to settle the score, but both times the weather intervened. The latest was supposed to happen on Wednesday, but Monday’s opener against Chaminade Julienne was rained out and rescheduled to that day, moving the rubber match one last time. Both juniors, Kleptz and Goodall played as second doubles teammates a handful of times their freshman year before taking over at first doubles last season. After the Trojans graduated five seniors, though, the pair brings back the most varsity experience, leaving them fighting for first and second singles this year. Both of them lost in the opening match against Centerville. Wednesday against Chaminade Julienne, though, both won as Troy claimed a 4-1 victory in its home opener. At first singles, Kleptz defeated Sam Kohls 6-0, 6-0, and at second singles Goodall defeated Connor Koeur 6-2, 6-1. The Eagles’ lone win came at third singles, where Wyatt Hench lost to Will Marshall 6-1, 6-0. At first doubles, Sean Dippold and Noah George defeated Joe Allaiva and John Muhl 6-1, 6-1. At second doubles, Henry Johnston and Spencer Short defeated Bryce Foster and Allen Eads 6-0, 6-2. And Thursday, the Trojans opened Greater Western Ohio Conference American League crossover play against Fairborn, sweeping the Skyhawks 5-0. At first singles, Kleptz defeated Nghi Nguyen 6-0, 6-0. At second singles, Goodall defeated Caleb Smith 6-1, 6-1. At third singles, Genki Masunaga defeated Janiel Buita 6-0, 6-3. At first doubles, Dippold and George defeated Silas Smith and Theophane Pradelle 6-0, 6-0. At second doubles, Johnston and Short defeated Wylie Parker and Sam Steck 6-0, 6-1. And even with the first and second singles spots still undecided, Goldner was happy that the Trojans got to start the season against a quality team like Centerville. 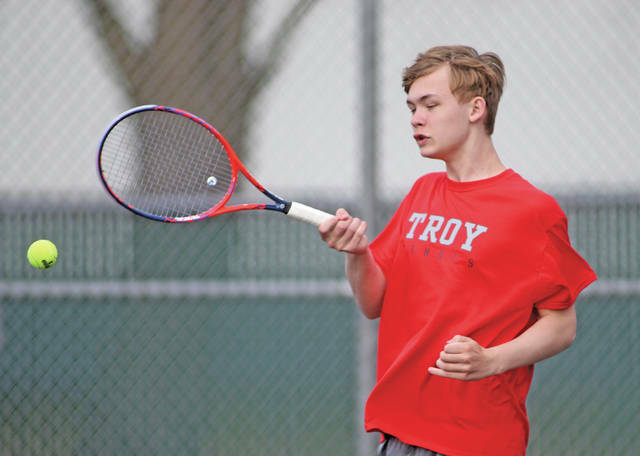 The Trojans (2-1, 1-0 GWOC American North Division) will get more competition and more lessons next week — Troy opens next week on the road at Fairmont, with a four-team tournament at Schroeder’s Tennis Center to cap it off. And by then, the lineup will be set, too. “One way or another, that ends tomorrow,” Goldner said. https://www.tdn-net.com/wp-content/uploads/sites/21/2019/03/web1_032819lw_troy_jacksongoodall.jpgLee Woolery|Miami Valley Today Troy’s Jackson Goodall chases down the ball during a match at second singles Thursday against Fairborn. 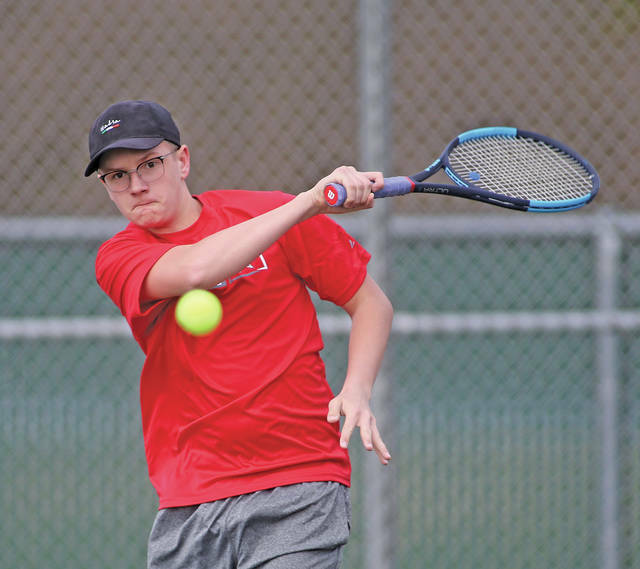 https://www.tdn-net.com/wp-content/uploads/sites/21/2019/03/web1_032819lw_troy_nathankleptz.jpgLee Woolery|Miami Valley Today Troy’s Nathan Kleptz follows through on a backhand during a match at first singles Thursday against Fairborn. https://www.tdn-net.com/wp-content/uploads/sites/21/2019/03/web1_032819lw_troy_genkimasunaga.jpgLee Woolery|Miami Valley Today Troy’s Genki Masunaga serves at third singles Thursday against Fairborn. https://www.tdn-net.com/wp-content/uploads/sites/21/2019/03/web1_032819lw_troy_noahgeorge.jpgLee Woolery|Miami Valley Today Troy’s Noah George winds up for a forehand at first doubles Thursday against Fairborn. 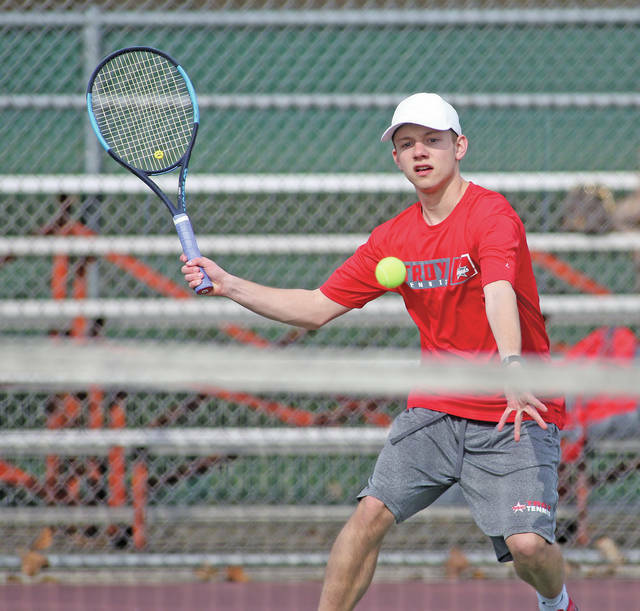 https://www.tdn-net.com/wp-content/uploads/sites/21/2019/03/web1_032819lw_troy_seandippold.jpgLee Woolery|Miami Valley Today Troy’s Sean Dippold hits a forehand at first doubles Thursday against Fairborn. 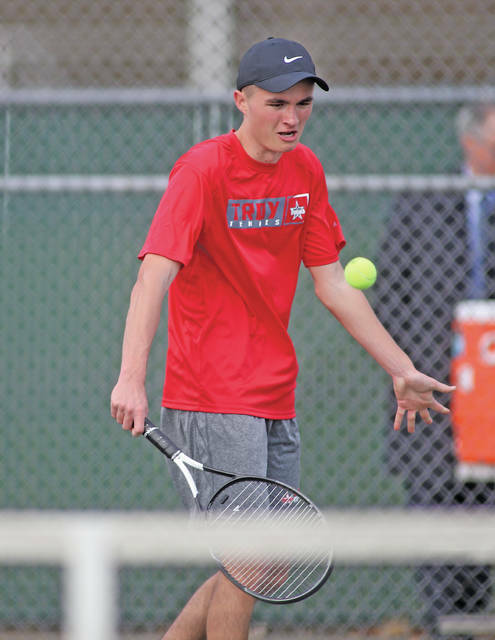 https://www.tdn-net.com/wp-content/uploads/sites/21/2019/03/web1_032819lw_troy_henryjohnston.jpgLee Woolery|Miami Valley Today Troy’s Henry Johnston follows through on a forehand at second doubles Thursday against Fairborn. 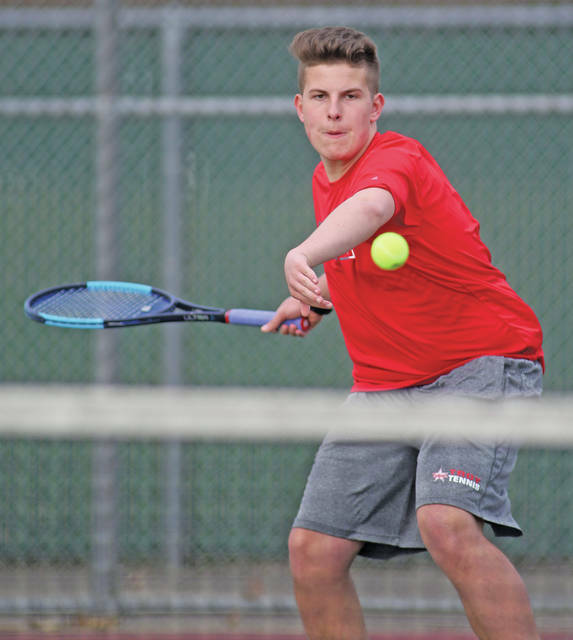 https://www.tdn-net.com/wp-content/uploads/sites/21/2019/03/web1_032819lw_troy_spencershort.jpgLee Woolery|Miami Valley Today Troy’s Spencer Short hits a forehand at second doubles Thursday against Fairborn.